After avoiding the vampire genre for so long (thanks to Stephenie Meyer turning it into one giant suckfest of romantic longing), I've lately been wallowing in it. Between watching seasons 1 and 2 of SyFy's Being Human, reading DC's excellent The New 52 I, Vampire, as well as Scott Snyder's American Vampire, my faith in the genre has been restored. Bring on the bloodsucking fiends! 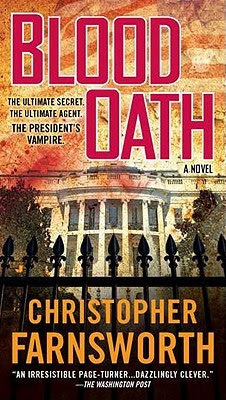 So I was more than ready to tackle Blood Oath, which, based upon several excellent reviews, I thought would also put the bite back into the genre. And my final verdict is . . . eh, not so much. The premise is promising: when a sailor is found aboard a whaling ship, surrounded by the ex-sanguinated corpses of his mates, President Andrew Johnson brings Marie Laveau in to bind the vampire to the office of the President for as long as he walks the earth. As a result, Nathaniel Cade has been our country's best kept secret weapon for 140 years, protecting our country against threats foreign, domestic, and supernatural. He lives in an off-limits wing of the Smithsonian Institute and uses his prowess as a hunter to serve our country. The latest threat? Dr. Johann Konrad may be helping Islamic jihadists create zombie soldiers from the parts of fallen U. S. servicemen. His credentials for doing so? He was in charge of Hitler's attempts to create Unmenschsoldaten, soldiers raised from the dead to fight without feeling pain, empathy, or hunger. Oh, and did I mention that waaaaayyyyy back in the day Johann lived in Castle . . . Frankenstein? I could hardly wait to wrap my peepers around the words that held so much promise for giddy, ridiculous, blood-drenched fun! Alas, the more promise offered, the greater the potential for disappointment. The book reads more like a movie script than a novel and all of the characters are flat and one-dimensional. The dialogue is groan-worthy; the attempts at humor are weak and obvious; the descriptions are virtually non-existent. Now, don't get me wrong, I like a good, light read, but I also expect it to be done with a certain flair and panache that keeps me entertained. If the banter had been witty instead of predictable, if the absolute absurdity of it all could have been embraced without always bringing it back to the seriousness of politics and patriotism, and, most importantly, if there had been a vampire that was interesting, this book would have lived up to my expectations. The greatest weakness of all was the one thing that, if approached differently, could have saved it. Nathaniel Cade is perhaps the most boring, tedious vampire you will ever meet in literature. He shows no emotion, he refuses to drink human blood, he's a tortured soul because of the sins he's committed, he admonishes people for taking the Lord's name in vain, he wears a cross that causes him pain to constantly remind him of his sins. Put a sweater vest on him and he could be a Republican candidate for president. Hell, Bunnicula has more of a personality than Cade. To be of interest, Cade needs a few more quirks and more menace; he needs a dash of the devil in him (like Anne Rice's Lestat). The one bit that held promise--Cade attends AA meetings to help him deal with his "thirst"--is only briefly touched upon and a brilliant opportunity for hilarity to ensue is wasted. I wanted Cade to want to raise hell and put a brick under it. Instead, he's just being compelled by the spell of a voodoo queen and a need to right his wrongs. One gets the sense that, if let off his chain he would promptly waste himself by walking into the sunlight or driving a stake through his own heart. By the end of the novel, I kind of wish he had. Historical Western. Wait! Come back, it's good! The Family That Shocks Together . . .